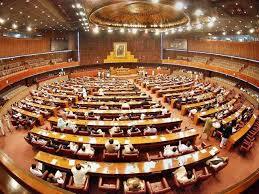 ISLAMABAD: The National Assembly Standing Committee on Information Technology and Telecommunication at a meeting here on Tuesday expressed its displeasure with Federal Investigation Authority (FIA) for not attending the meeting and failure to inform about steps taken to control blasphemous material on social media. The meeting held under the chairmanship of Syed Ali Raza Abidi was briefed by Pakistan Telecommunication (PTA) chairman about the actions taken by PTA against the blasphemous material on social media. When the committee called the FIA about their actions against the blasphemous material on social media, nobody was present at the meeting to respond. The committee showed its displeasure with FIA for not attending the meeting and directed that FIA must attend the next meeting and brief the committee about the blasphemous material on social media. The departmental representative from Universal Services Fund (USF) briefed the Committee about their performance during the financial year 2017-18. The committee appreciated the performance of the USF. Thereafter, the representative of Special Communication Organisation (SCO) briefed the committee about their performance during the financial year 2017-18. They also shared some grievances with the Information Technology and Telecommunication Ministry. The committee appreciated the performance of SCO and directed the ministry that SCO should be treated like other private national or international organisations. Further, the committee directed that in next meeting of the committee, SCO may be taken on the agenda. The committee took up the TIP employees’ issues and said that the issue will also be taken up at the next meeting. The committee further directed PTA chairman to launch a public awareness campaign to get rid of the “Blue Whale” game.